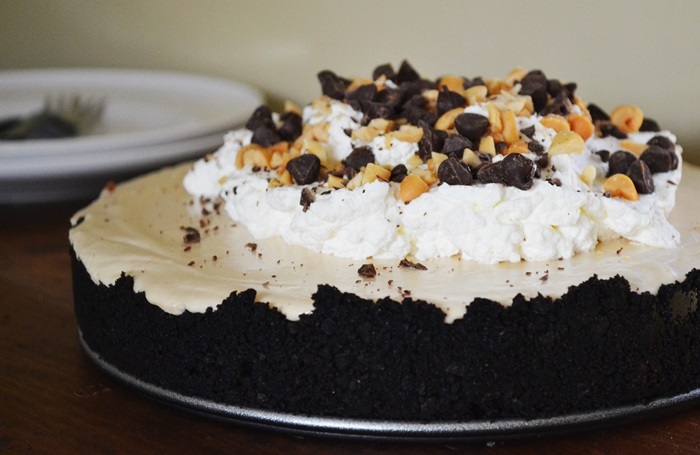 In honor of John’s birthday on Friday, I decided to finally make the peanut butter pie that’s been sitting in my “recipes to make” folder (an actual manilla folder, not a virtual one) for 2 years. 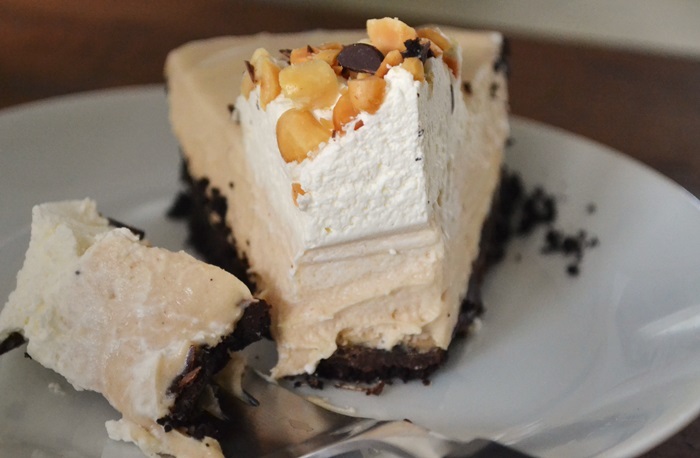 With its dense chocolate cookie crust and cold, creamy peanut butter mousse-like filling, I knew John (hater of cake but lover of peanut butter) would approve. My fellow food bloggers will know this pie. When blogger and cookbook author Jennie Perillo lost her husband and father of her two young daughters to a sudden heart attack in August of 2011 she posted this recipe, Mikey’s favorite, and asked her readers to make one in his honor and share it with someone they loved. The blogging community responded with an explosion of peanut butter pies, and while it’s taken me awhile, I’m glad to add my pie to the list for someone I love. For his birthday we headed up towards the White Mountains for some pre-foliage zip lining. I normally bring a camera with me everywhere, or at least rely on my phone, but when faced with the challenge of hanging onto it while being strapped into a harness and hurtling through (and above) the trees, I ditched technology and decided to just enjoy myself. Amazingly, I didn’t need to Instagram it to have a great time (though I will bring my point and shoot with wrist strap next time!). This pie is delicious and if you use the microwave to melt the butter and chocolate, you won’t need to go near the oven. A layer of melted chocolate topped with chopped peanuts goes underneath the peanut butter cream, giving each bite a satisfying heft that nicely balances the pillowy filling. I topped my pie with an additional mound of fresh whipped cream and sprinkling of chopped peanuts and chocolate chips — fit for a reluctant birthday gentleman. In a food processor, pulse cookies until crumbled with no large chunks. Pulse in melted butter. Press the crust into the bottom and up the sides of a 9-inch Springform pan. Melt chocolate in a double boiler or in the microwave on low power. Gently spread the chocolate on the bottom of the cookie crust using a pastry brush, then sprinkle the chopped peanuts over the melted chocolate. Beat the cream until stiff and fluffy, then store in the fridge. Using a stand mixer or hand mixer, beat the cream cheese and peanut butter until combined, and then slowly add in powdered sugar. Then add the sweetened condensed milk, vanilla and lemon juice. Add 1/3 of the whipped cream to lighten the batter, then use a rubber spatula to fold in the rest. Pour the peanut butter filling into the prepared crust. Refrigerate the pie for at least 3 hour or overnight. If you like, serve topped with extra whipped cream and a sprinkling of roasted peanuts and chocolate chips. 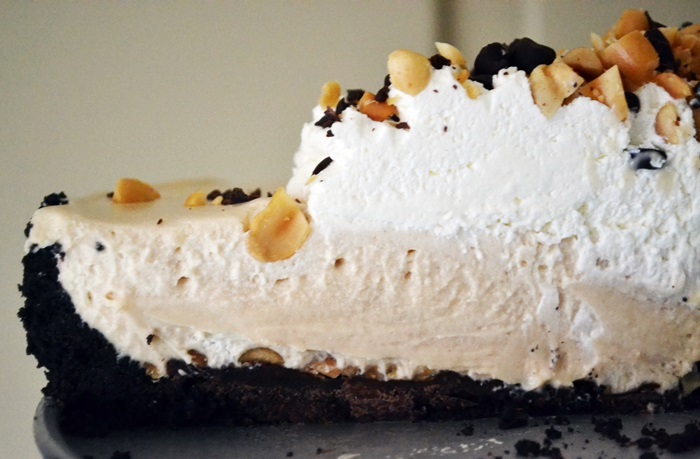 Click to view and print the recipe for No-Bake Peanut Butter Pie. Love peanut butter! Love chocolate! Thanks for sharing this! Best wishes! Hello! Thanks so much! It’s really a terrific pie for any PB lover. I just died and went to heaven. Love all things peanut butter – need to try this out!